Home » apple , ipod , ipod nano , steve jobs , technology , videos » Darn you Steve Jobs! Catch me anywhere out and about, and chances are I've got my iPod classic hanging on my belt. It's the first iPod I've ever owned, the model that came out two years ago with the 80 gigabyte hard drive. And yesterday was the annual press event where Apple rolls out the newest iPod models. I was expecting to not update to anything new until sometime next year, when I figured that flash storage will finally catch up to the capacity I demand that's currently only on hard drive. And that might happen then, since the latest iPod touch now maxes out at 64 gigs of flash memory (I'd way love to see at least that much on an iPod classic design). Then I saw the 5th generation of iPod nano. And I am now lusting for one terribly. FM radio (with Live Pause - sorta like audio DVR - and iTunes Tagging). Built-in voice recording capability. And... a video camera with 376 x 240 resolution. I could literally not run out of neat ideas to try with this gimmick. All of them legal, of course! 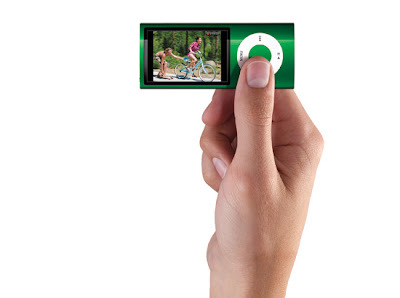 The 16 GB iPod nano is going for only $179. Not a bad deal at all! So I'll probably be heading to that new Apple Store in Greensboro sometime soon: second visit ever, but first with a purchase in mind.